Tingey (White Pine Touring). Photo: Shannon Boffeli. Heavy winter snowfall and early season rains have left Round Valley lush, green, and blanketed with wildflowers. While the temperatures remained in the 70s, the bright sunshine made the racing feel hot, as a very late spring/early summer has kept most riders accustomed to colder temperatures. The racing started with the pro men leading the way. All the top area riders were accounted for except Bryson Perry (Lifetime Fitness), who recently fractured his scapula in a road bike crash. Whole Athlete rider Keegan Swenson jumped off the front on the short start loop and immediately gapped the field. Cannondale’s Alex Grant was the only rider able to match the pace of the nation’s top junior rider. The duo were indeed “going fast” as they opened up a lead of over a minute on the first of three laps and kept increasing that lead until the finish. 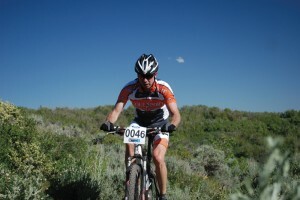 Chad Wassmer (Cole Sport) finished 2nd in the Expert 30-39 category. Photo: Shannon Boffeli. Early on it was Jason Sager (Jamis), Kevin Day (Kuhl), and the Rooster’s duo of Nick Fisher and Brent Pontius doing the chasing. Sager was the first to go initially yo-yoing in and out of the group. Day quickly followed as the early pace took its toll. The chasing was now left up to the Rooster’s duo of Fisher and Pontius and despite some teamwork on the open doubletrack sections of the course they were no match for the leaders. Swenson and Grant continued to round the course locked together, never more than a bike length apart. The two leaders, both excellent climbers, attacked the grades so fast they appeared to be riding flat ground. Throughout the third and final lap Grant was doing all he could to drop the junior rider. Standing and powering every chance he had, the Cannondale rider was never able to shake his companion. Behind the front of the race, Reed Wycoff (Contender) was turning in a spectacular ride after being outside the top-10 on lap one, he started using his horsepower to reel in riders. On lap two, Wycoff had moved inside the top-10 and by the third lap he was threatening the to go inside the top-5. As the leaders approached the finish, a quarter-mile section of doubletrack lay ahead. Alex Grant remained on the front determined to ride Swenson off his wheel. As they rounded the final turn, before the slightly downhill finish, Swenson finally made his move and jumped out front. Gassed from all his work on the front, Grant was no match for the surging Swenson. Swenson charged across the finish line for the win with Grant just 2 seconds behind. Nick Fisher overpowered his teammate for third with Pontius coming in fourth, an impressive finish for both riders. Behind them, Reed Wycoff polished off a great recovery overtaking Jake Pantone (Rooster’s) for the fifth spot. Round Valley proved to be an exciting racecourse with a lot of close battles. In the pro men’s race, the four riders who finished 9th through 12th were separated by just 33 seconds. After an exciting men’s race, the women also put on a top quality show, with reigning National Ultra-Endurance champion Amanda Carey (Kenda/Felt) on hand to contest against the top Utah pros. The women’s race was more evenly paced than the men’s with the top four women staying in contact throughout the opening 9-mile lap. Carey held the top spot but Erica Tingey (White Pine touring) sat right on her wheel. Kelsy Bingham (Jamis) and KC Holley (Trek 29er) were just a handful of seconds behind the leaders. The women were slated for a full 3 laps as well and on the second, Tingey made her move taking over the top spot. Tingey’s time out front was short-lived however as the effort may have taken more than she had to give. And then it was Carey’s turn to get out of sight. Carey has spent a lot of time leading races in the past 2 years and she knows how to stay out front. While she never built an insurmountable lead, her gap was enough to keep the contenders off her back. With Carey out front, Tingey started to feel pressure coming from the Jamis rider Bingham. Little by little Bingham was closing down the gap and by the time they hit the final quarter mile before the finish just 10 seconds separated the two. Determined to keep her second place, and the money that went along with it, the White Pine Touring rider gave everything she had. The two riders crossed the finish just 9 seconds apart with Tingey holding on to her second place. Neither could catch Amanda Carey though as the Kenda/Felt rider took the win by a minute. KC Holley took fourth followed by Jenelle Kremer in fifth. USCS officials handed out over $2,500 in cash after the race with the top pro male and female racers taking home $420 and $371 apiece. The next round of the Utah State Championship Series takes place on July 9th with the PC 50. 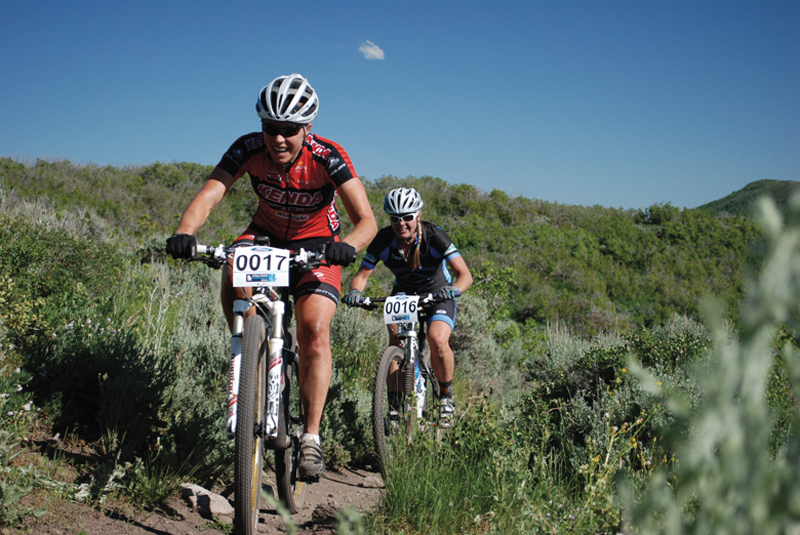 A 50-mile race starting at Park City Mountain Resort and finishing at the Canyons resort just outside Park City.